This blog post is built on David Elkind’s classic book, The Hurried Child. The push to grow up too fast has intensifed since he first published his ideas. Healthy or not? 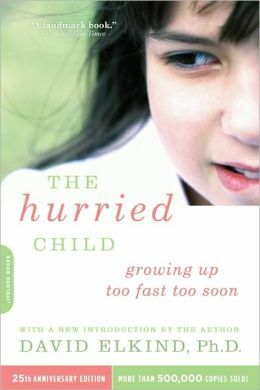 Elkind’s 25th Anniversary Edition of his classic The Hurried Child was published in 2006. The fact that 500, 000 copies were sold speaks to how worried or pulled some parents are about the loss of childhood. I first read the book when it was first published. It made great sense to me then and the basic idea that children need to play still does. I occasionally watch shows like Toodler’s and Tiaras and shake my head in dismay. But I have yet to meet a loving parent who isn’t a bit pushy about teaching reading readiness, particularly with a first born. And yes, I am guilty of counting steps when out and about with the grands. My refrigerator is awash with alphabet magnets, and when I care for the grands, I watch Sesame Street and Barney with them. Finally, because of my own battle with growing deafness, I make sure they watch tapes on learning to sign. I was absolutely delighted that my grandson at a year loves the Signing Savvy tapes. So I am as guilty as the parents on Toddlers and Tiaras, just in a different direction. What to do? Tip one: Recognize the extent of the problem. Few parents are into the Toddlers and Tiaras kind of pressure, but every parent I know is into getting toddlers ready for school and a second group are taking their six month old babies to swim class or fitting a two year old with a football helmet. Is that you? Then ask yourself why? Is it for you or your child? My first born loved the water and was swimming easily by the time he was two. We didn’t enroll him in class, but did do our own version of early swimming lessons at the local swimming pool. However, and here is the point, second born son did not take so easily to early swimming. We didn’t push him and by the time he was in first grade he was on the local swim team. Neither David nor I were heavily into competative sports. Had we been, we might have been more pushy. So do a bit of self analysis and pull back a bit if you are pushing your child to meet your needs and not his or hers. Add to this natural push, parental applause, and the desire strenghtens. The little girls I see on Tiaras and Toddlers or Dance Moms, to mention another show of the same ilk, are a bit more talented than many of their peers, but their biggest talent lies in wanting to please doting mothers and fathers. Tip three: Be realistic about your child’s talents, the odds of achieving Olympic gold, becoming a professional ball player of one sort or another, or of winning American Idle, Miss America, Miss or Mister Universe are slim. Tip four: Be equally realistic about what it will take in terms of money, time, and parental support to groom even the most talented child for the Olympics. We could all take a lesson from Gabby Douglas, the 2012 Olympic gold gymnast. Her talent helped, but in the long run, at the age of 14 she had to leave home and move in with strangers in order to get the coaching she decided she needed to become the best of the best. Her mother deserves kudos for allowing Gabby to make that move. Tip five: Understand that until a child gains the ability to think broadly, what the experts call abstract thought, she or he will not have a realistic grasp of either personal talents or the odds of becoming a star. Our second son loved baseball. He dreamt of being, Keith Hernandez, star first baseman of the New York Mets. Did he have talent? None what so ever. He sat on the bench or hovered in the outfield. Could we convince him to drop out of Little League? No way. Then when he was eleven, he announced that he was probably not going to make it to the Big Leagues, but he would keep trying. At twelve, he dropped out of Little League and angrily asked us why we had pushed him. Believe me we had not, but we did let him play, attend all his games. In his mind that was pushing. Tip six: Because the good life seems to depend more and more on a college education, it is harder to let go of pressuring your child to do well in school. But most studies show that academic performances is not as important as what Daniel Goleman popularized in his book Emotional Intellience. Focusing on teaching your children kindness, good manners and concern for others will see them further than pushing academic As. Tip seven: Play means being happy; so if the child is not happy, he or she is not playing. Use that as measure and let the child decide, with the exception of having to do the best he or she can in terms of school. Even that can be trickly, so for more information about school difficulties, you might want to get my ebook When Good Kids Struggle in School. Tip eight: Today’s world has become increasingly over-scheduled and contained. Children no longer have the freedom to roam at will the way my brothers and I roamed. Sad. Still parents can create some free time and “just be” time for their children. To do so, include some quiet time in each day. A half an hour playing quietly in your room with the rule being “no electronics” can be instituted. Helpful to have some craft and hobby material on hand, but the important thing is that it is the kids’ time to life without structure or electronics. Some will nap, some will read, some will sit and stare, some will puruse hobbies. Whatever, the important thing is the child does mostly what he or she wants to do. Not as good as the freedom children once had, but better than nothing. Finally, along the same line, as I often point out, make weekends less structured. A family visit to a park can allow each to explore some free time with the edict being mainly to stay in view. Not easy, I grant you, but vital. Life is a struggle, relationships hard, raising good kids in today’s world harder than ever. For more reading try any one of me ebooks If you are stressed as a parent try Parents Are People Too: An Emotional Fitness Training Program for Parents. This entry was posted in Parenting Issues and tagged David Elkind, Emotional fitness, Emotional Fitness Training, help for parents, how to parent, Katherine Gordy Levine, Parenting advice, parenting teenagers, parenting tips, postaday. Bookmark the permalink.